Trainer Darren Weir is keen to back up Cliff’s Edge at Flemington next week after a tough win in the Group 2 $200,000 Schweppes Crystal Mile (1600m) at The Valley today. Cliff’s Edge, above, raced on the pace before winning the Cyrstal Mile at The Valley. Photo by Ultimate Racing Photos. Weir had the option of stepping Cliff’s Edge up to the 2000m of the Group 1 $2m Seppelt Mackinnon Stakes (Emirates Stakes) at Flemington in two weeks but looks likely to prefer to run the four year old over the 1600m again in the Group 1 $1m Kennedy Mile next Saturday. “He has got the perfect racing style,” Weir said. Winning jockey John Allen had Cliff’s Edge quickly into stride and sat at the leader’s girth before putting the pressure on at the 400m mark. Cliff’s Edge ($2.80 favourite) and Siege Of Quebec ($3) eye balled each on the home turn and the Weir toughness came to the fore with Cliff’s Edge toughing it out to the line to record a first class win. Runner up Prized Icon ($10) and third placegetter Duca Valentinois ($31) battled out the minors while Siege Of Quebec hung on for fourth. 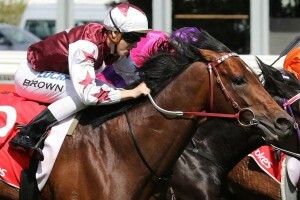 Cliff’s Edge has now firmed in from $16 to $7 for the Kennedy Mile at Ladbrokes.com.au.